Only an experienced performer could write a practical book of this kind. No theories, but facts and tested procedures - that are invaluable when put into practice. Therefore, you are not only getting an ebook containing original tricks, moves and routines, but information that will pay you dividends, be you beginner, amateur or professional. You will feel more sure of yourself after reading this. Can A Trick Be Too Perfect? And why not? What Does It Get You To Expose? - Read what Monk has to say about this. In addition, The 50-Card Lift will make a hit with all card workers as will the Behind Your Back routine which is a real fooler. Face To Face was one of Monk's favorites and it is still hard to beat. 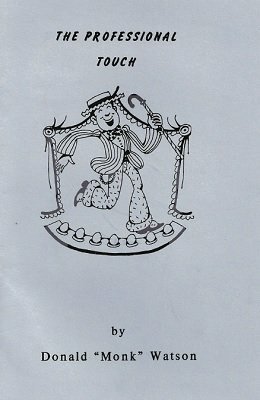 Those who saw Monk perform his invisible milk routine will know what to expect in a Milky Mix-Up and the Hand Rabbit Routine is included in these pages by the kind permission of Dell O'Dell who also allowed her original rhymed patter to be included. 1st edition 1945, 49 pages; PDF 44 pages. Probably the best book ever written on the presentation of magic! Chris has done the magic world a great service by making this available again. I remember reading this as a teenager and it changed the way I looked at magic FOREVER. If you wonder how I become so clever, well this book was the starting point. This should be required reading for anyone doing magic! My highest recommendations.